Gosh and golly! I sure had a great time at a prayer meetin’ in a little town called Mount Pleasant last evenin’. It’s a charmin’ place, but it’s come on hard times with its pickle factory layin’ off a bunch o’ workers. Never fear, though! Hope abounds in the deep and abiding Christian faith of the place. Pastor Mervin Ogelthorpe is a mighty enthusiastic young messenger of the Lord, and he has done the town a great service in recruitin’ the Sanders Family Singers to come and bring the everlastin’ inspiration of the Bible to this town. The family is sure full of interestin’ characters, and they sure can put on a good show. Adapted from a book by Connie Ray, this musical is an evening of great fun and knee­slapping music set in a small town with bluegrass roots. Director Sarah Rodgers has shown her finely tuned talent in evoking the character of a small community of people of simple faith. Costumes, props and make­up are largely reminiscent of the 1930s setting. Having lived in a small evangelical community, I can attest to the accuracy of the dialogue, personalities and behaviours of everyone in the show. Mack Gordon portrays Pastor Mervin Ogelthorpe brilliantly. His naive enthusiasm has just the right amount of sincerity to make him lovable to us city­slickers as a bit of a goof. Lalainia Linbjerg Stelau shines as Vera, the matriarch of the Sanders family. Damon Calderwood puts in a strong performance as her husband Burl, and his harmonic talents come through in several of the musical pieces. Their grown children are introduced to us in wonderfully believable performances by Kim Larson (twin Denise who chafes at the bit and fights the temptation to go out into the world), Matthew Simmons (her twin brother Dennis, quiet and shy, but, when freed by inspiration, alive and enthusiastic), Kaitlin Williams (sister June who struggles to overcome her feelings of inadequacy in this talented family), and Gordon Roberts (Burl’s brother and the children’s uncle, who has recently been released from prison). These family members are the principal performers of this evening of rollicking spiritual song. Their musical instrumentation and singing talents carry the evening. 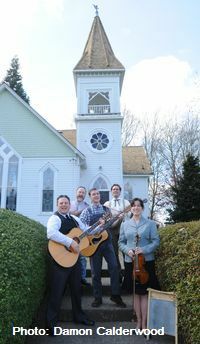 Their musical performances are bolstered by the talented banjo picking and fiddle playing of Stephen Bulat (cousin Clem) and Kevin MacDonnell (cousin Cletus). Overall, the singing and playing had just the right balance of professional skill and small town amateurism to make the entire experience believable. 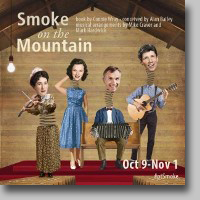 Smoke on the Mountain is one of the best shows I’ve had the pleasure to review. It’s funny, fresh, authentic toe­tapping enjoyment through and through. Go see it, and God Bless Ya!